I found the coolest little book store on Pearl Street this morning. Sat in there in a big comfy chair, drank regular coffee from a larger than life coffee cup and perused half a dozen books. 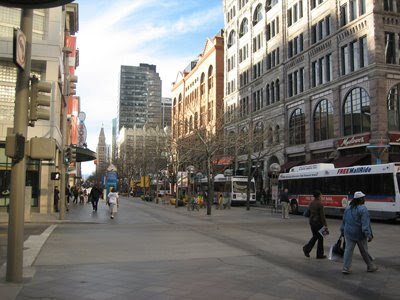 To quote that great theologian Janice Joplin "take another little piece of my heart now baby.."
They call this area of downtown Denver the 16th Street mall and it's FAB-U-LOUS! The building just left of center is the one I'm talking about. The interview was long. LOOOONG. But I think I knocked my part out of the park. I sat in the room with three people all of whom had seen both of my portfolios. The peppered me with questions for about 45 minutes...not hard questions just "questions". Then they spent time telling me about the company. I'd heard alot of it from SS but they went into way more detail. Hurray! I'm glad that it's a prospect that you're excited about (especially since Wolf said he'd move for you, if necessary). It's good not to worry about "what ifs" and just delight in the possibilities. My fingers are crossed for you, dear!